Posted: Wed 18 May, 2005 6:15 am Post subject: How do you display your collection? I am curious how others display thier collections, armour primarily, but weapons as well. I will be building a house when I get back state-side, and I intend to set aside some space for my toys. At this point my wife and I are still living out of a one bedroom apartment so space is at a premium. Unfortunately that means much of my stuff is carefully stowed in the closet, however, within the next two months we'll be moving into our first home and I've already claimed a room as something of a personal "museum". 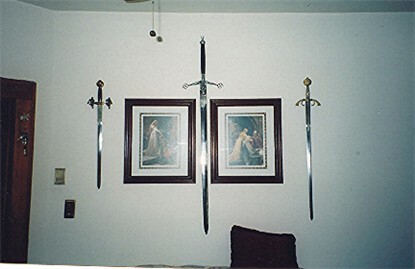 Weapons tend to be easiest for me since I tend to hang them on the wall behind and above my armor. I try and set them in a pattern with some of the swords on an angle, whatever makes it asthetic. I do make sure that everything I hang is either against a stud or using a wall anchor if not. The last thing I want is for any of my weapons to come crashing to the floor, tip first especially. As for armor PVC has been my friend. 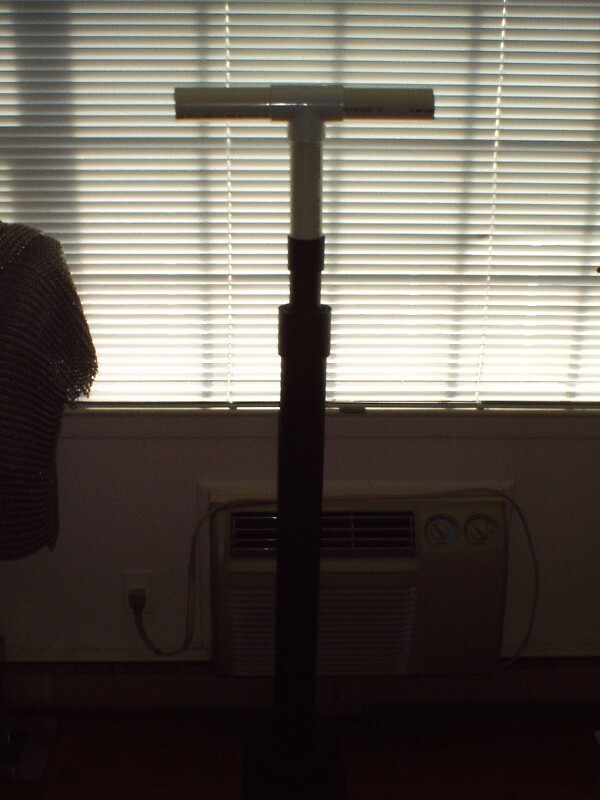 For relatively little money you can make a trip to the local plumbing supply or hardware store and pick up a variety of pieces, bends, etc, enough to make a sturdy stand. I generally use 3" sch 40 for the base and then 2" sch 40 along with some ells if I need to make shoulders or arms. It all depends on what type of suit you are hanging. To keep the base from tipping over you can cut a square of 3/4" plywood and affix it to the PVC. 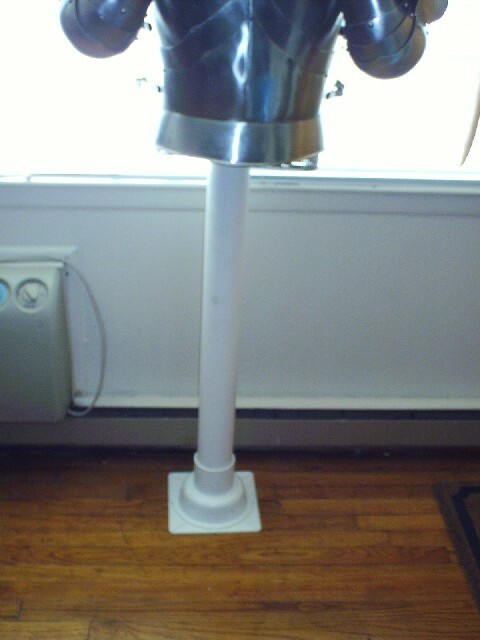 Another option, the one I took, was to purchase a PVC drain which was 8" x 8" grate with the pipe fitting underneath. Inverted it acts as a nice flat and stable surface. 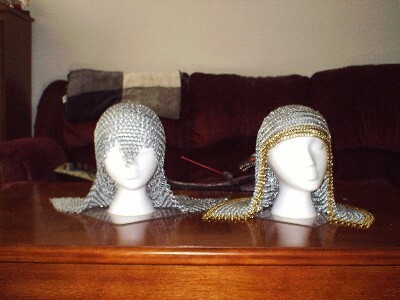 For the several maille hauberks I have, a simple t-styled display base works great. Throw a little primer and paint on it and it works well enough. For the couple transitional suits I have I ended up adding on extra pieces for arms so I could display all the pieces of the armor. When it came to the one full milanese suit I have I broke down and spent the money on a stand I found online. 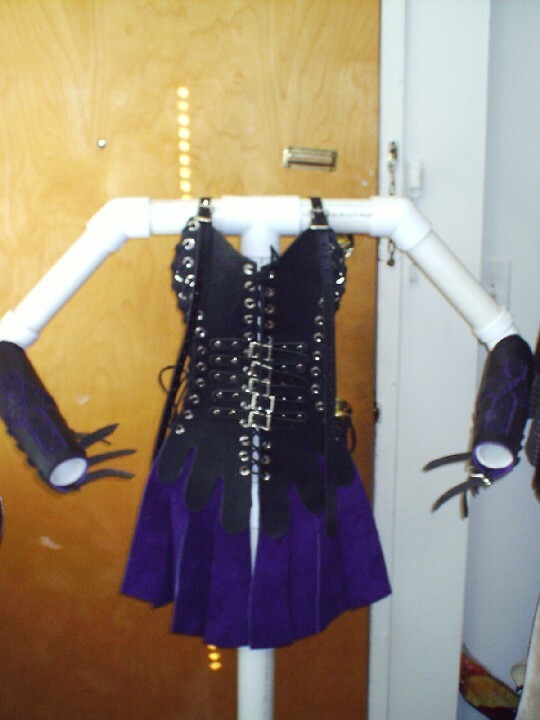 I debated on building my own, but just didnt have the time to map out how to attach the legs, arms, gauntlets, etc. Wood is also another medium that works fine and is easy to manipulate into the desired shape, although cost wise I think you'll find it more expensive then PVC. The upside being that it can be stained and varnished and will probably look nice, especially if you have the patience and tools to do some scroll work on the exposed lumber. I'm sure others will throw in their opinions as well. If I get a chance tonight I'll strip down one or two of my displays and take a couple digital pictures and post them tomorrow. Dominic has already hit on a couple of the main ways of displaying armour, primarily for the body. If, however, you are helm-heavy, there are some other options. Fundamentally, what is used is some form of a post on a base – kind of like the countertop paper towel dispensers. These should be exceedingly simple to make – either buy or make a suitable base from wood, and attach anything from a simple dowel to a fancy turned spindle or table leg. If you want / need, a wooden ball or tennis ball can be mounted on top to provide a bit more stable platform for the helm to sit. These look nice on or on top of a set of shelves. I have been working between other projects on a design for a couple of different armour stands from wood. 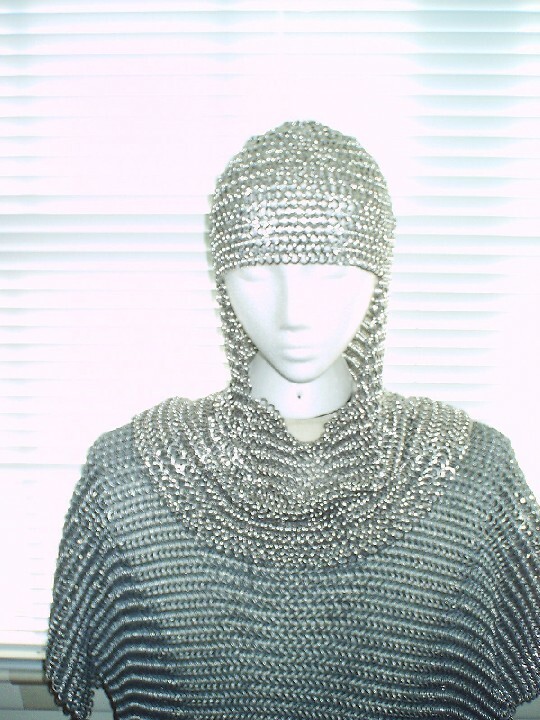 One suit is maille, head to foot. Since the feet are soled, I cannot have the legs actually bolt down to the base, so will be setting up something like a double cross – one cross member at the “hips” to hang the legs from, and one for the shoulders. 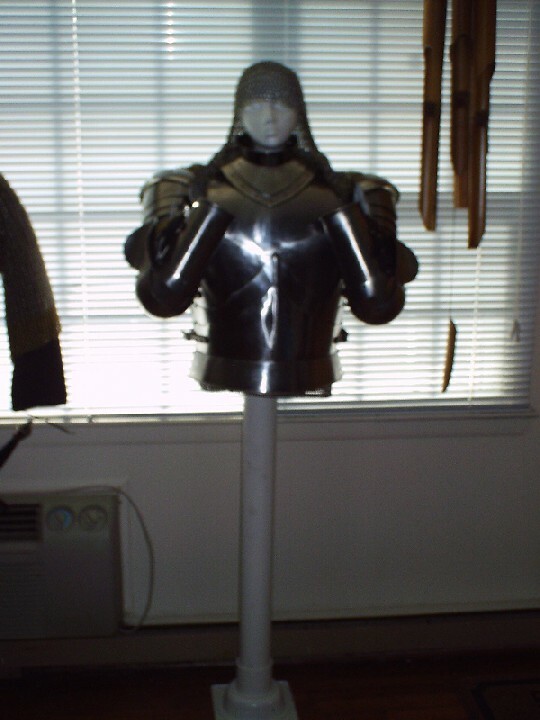 I likely will just use rolled up poster board to fill in the arms and legs under clothing set up inside, or, since there is no pose or face, I may just let it hang as if on display at an armourer’s shop. The other is a full 16th Century harness. For this, I do intend on separate legs and full arms. This one is proving a bit more of a challenge than my free time has allowed of late, but the armour should be finished soon, so it is moving upwards on my project list. 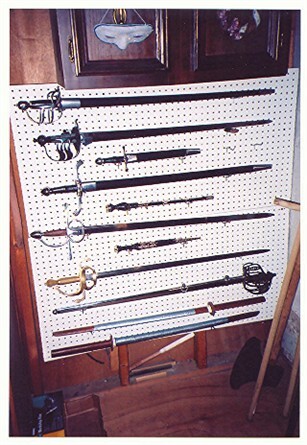 Some of my swords are currently set up on a free-standing 10-sword rack that was designed for Asian swords. Don’t do this. The guards conflict horribly. The rest, well… safely in the closet until I can devise a better way. I have also been working on a design for a cabinet like a glass gun case. It’s looking to be between 6 and 8 feet wide, 6 feet tall and about 18 inches deep. I have put this on hold due to cost – this would not only entail wood purchases, but a couple of not-so-cheap tools as well. It would be cheaper, I think, to build shelving or displays into the room than build separate furniture, but it does limit you to a single way of displaying it. Collections tend to change (mine just keeps expanding somehow ) and some degree of flexibility is desirable. If I were building a house though I would build a display case into an interior wall. Here's a wall in the back room of my house where I keep my "stuff". Everything comes down and goes into the safe when I leave town. I'm blessed with an understanding wife. This is the only room I get though. Here's a quick and dirty helmet stand I made. I think it cost me all of $3.00 and about half and hours worth of time. Believe it or not, the only way I display my collection is on My Collection Gallery here on myArmoury.com. I don't have any of my items, save for a forge-folded Cicada Forge katana (which ironically is not featured on-line) out in the open in my house. 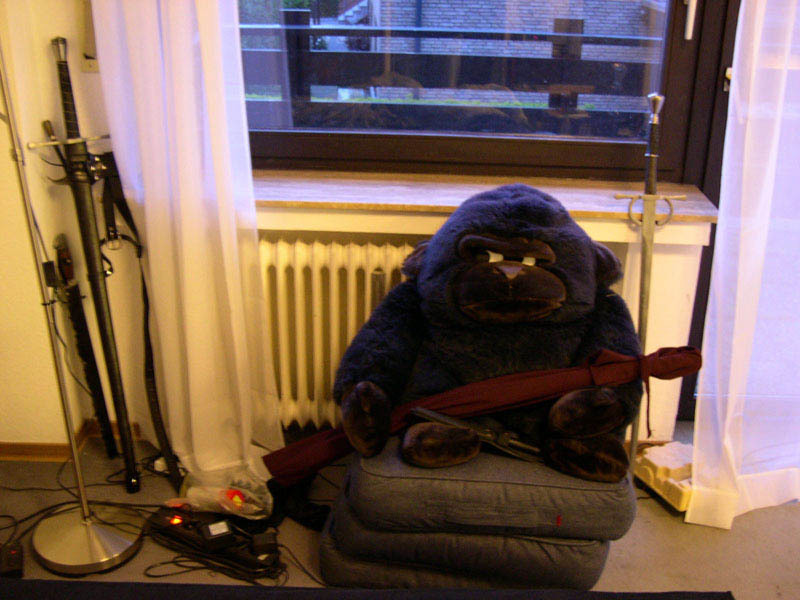 Posted: Wed 18 May, 2005 2:42 pm Post subject: How do I display my collection ? Mine's all over in small groups and seems to change with my / my wife's mood. 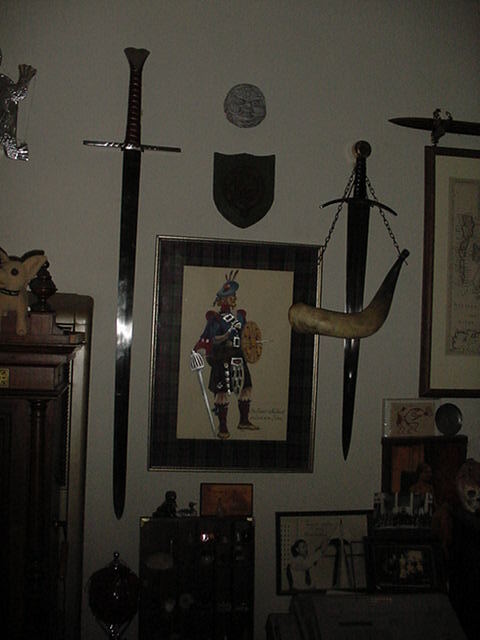 ( that's MacDonald of MacDonald the Lord of the Isles with a clan crest and a green man from Rosslyn chapel) I also have a couple of helms on stands on table and bookshelf. W. ...Here's a quick and dirty helmet stand I made. I think it cost me all of $3.00 and about half and hours worth of time. Similar concept. Cost me $8-10 at Lowe's, IIRC, but took less time. It is just a paper towel holder. Huh? No scabbards?? Ya mean like the cobbler whose children have no shoes??? I'm planning to put my longswords up on a wall display. Pretty much... when do I have time to do scabbards for my swords? Here are a few shots of the displays I have currently setup in the apartment. Unfortunately my skill with a digital camera is rather minimal so I apologize ahead of time for the poor lighting and angles. Hopefully this gives you some ideas, albeit basic, but still functional for what I need. 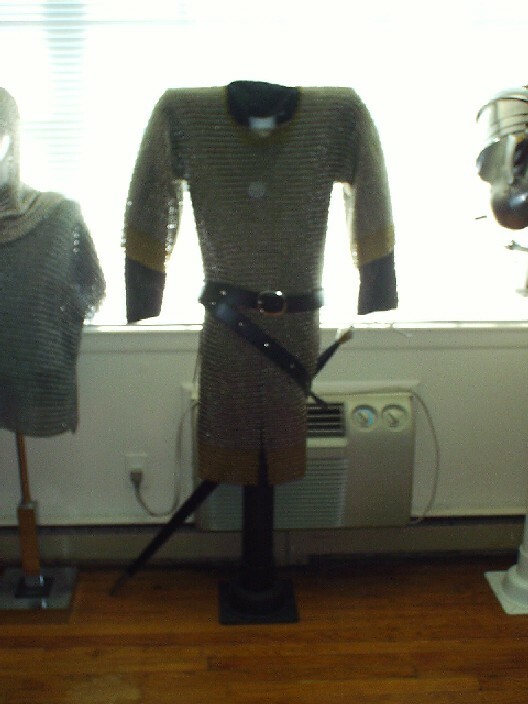 The same display this time with my maille hauberk in place. In the old days, when the armor stood up like a 'man was in it' but there wasn't, how did they do that? In reality, with an armour stand, either of wood or of metal, and of varying complexity and design. In the Three Stooges, it was a careful balancing act - hard to have it crumble to a pile of rubble with a stand! a few "wall hangers" in the liviing room and my U-C LOTR collection in the family room. Dominic - those displays look pretty good. But, you might consider painting some beards on those styrofoam heads, to make them look a little more like "manly men" . Oh, If you decide to do this, don't use solvent-based markers, glues, or paints... unless you want them to look like they had a severe run-in with a horde of Huskarl's axes! Test it on a styrofoam cup first. Styrofoam melts. My collection isn't so much "displayed" as it is "laying about the place." I have an Atrim on a chest of drawers (in which I keep my drawers oddly enough.) Leaning in the corner is a gigantic Marto SLO. I have an double headed axe leaning up against another wall, and keep the India made rapier, and sharpened crowbar in the closet out of shame. There are several threads on this around if you use the Search function.